Are you making these common pest control mistakes? Before you treat an infestation, do your best to discover its cause. Spraying ants with ant killer will kill the ants that you see, but you need to ask why you’ve got ants in the first place. Figure out whether your home’s foundation has unsealed gaps – also check windows, doors, and other seams. If you do find gaps gaps, seal them. After you’ve eliminated the entry points, bait the insect with a product that specifically targets the invader. Keeping a clean house is one of the best ways to have a pest-free home. Pests view your living space as a great place to take shelter and find food. In the kitchen, never leave crumbs on the counters and floors, wash and dry the dishes daily, and empty the rubbish bin every other day. In the rest of the house, vacuum all carpets several times per week, clean out your sinks and shower drains, and regularly recycle old paper products such as newspaper and cardboard boxes. You should also look at the condition of your garden. Messy and unkempt gardens invite pests onto your property, which puts them that much closer to your house. It’s important to know exactly what you are dealing with! Each pest needs a different treatment approach; there is no one-size-fits-all treatment. Once you can identify the pest, then you’ll know its strengths and weaknesses on how to get rid of the pest using the right products. 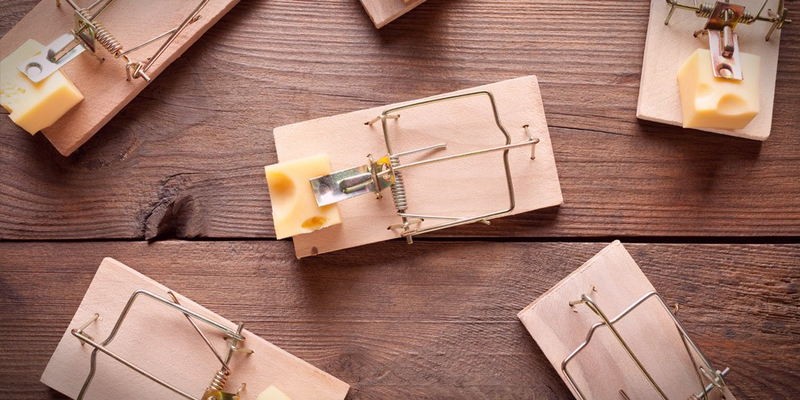 Don’t place traps in the middle of rooms – rodents keep to the areas they consider safe. Set the traps close to the wall and place them, as well as the bait, in dark corners, behind appliances (stove, fridge), or right near a place they may gain access, such as a hole or crack in the floorboards. If you kill the adult generation and immediately stop addressing the infestation, some of the young will hatch or grow up and keep breeding. To avoid this, consider baiting for a few weeks just to make sure the infestation is under control. Many pesticides, baits, and repellents are harmful to pets, children, adults, and the environment when touched, ingested, or mishandled. Use safe handling and application procedures whether using toxic substances or a natural pest control strategy. There are a variety of DIY treatments homeowners can perform to treat pest infestations. However, the average homeowner is not an expert on pest control and often makes simple errors that render their DIY treatments useless. MiWay clients with a Home Insurance policy have access to MiHelp, a 24-hour household emergency assistance.